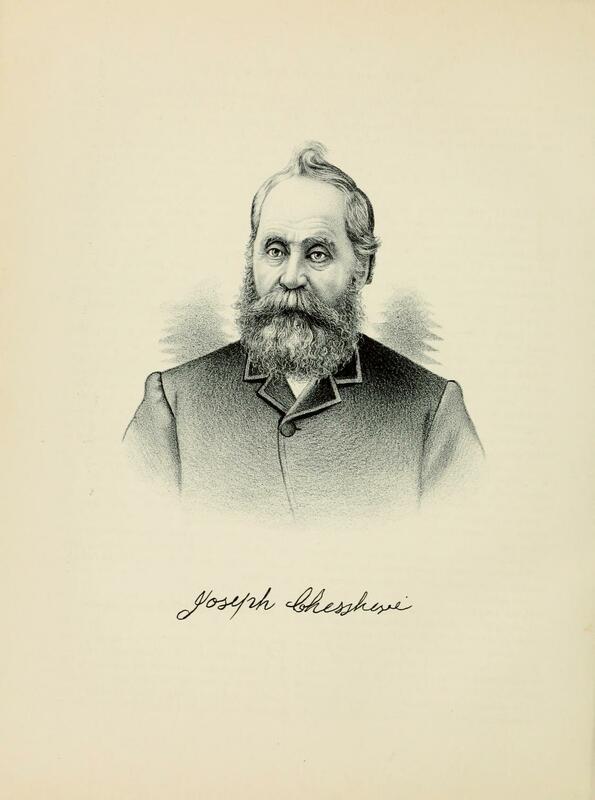 JOSEPH CHESSHIRE. The noiseless and inaudible foot of time has so stealthily passed over the sixty-six years that our subject numbers since his natal day, that he is only aware of its passage by seeing grown up about him sons and daughters who have reached manhood and womanhood, and who have families of their own. At sixty-six a man is in the prime of his vigor, and to hear the little grandchildren pertly telling of things that have come within their young knowledge that are new to the man seems an encroachment upon his rights and perquisites. It is not the years that makes us old. It is the little ones that crowd us. Our subject resides on section 20, in Rural Township, Shelby County, his residence in the county dating from the spring of 1866. He was born in Hampshire County, W. Va., September 6, 1825, and is a son of Obadiah and Sarah (Switcher) Chesshire, who were natives of Hampshire County, W. Va., the mother being of German descent. The parents lived and died in their native state, having pursued the calling of agriculture from their earliest efforts at making a living for themselves. The mother died about 1857, the father following her about 1867. Our subject is one of fifteen children, of whom twelve lived to reach years of maturity. Two of these, our subject and one sister, Margaret, came to Illinois and made themselves homes. Joseph Chesshire was reared on the home farm where he remained until his marriage, which took place December 4, 1850. His bride was Miss Ruth Lupton who was born in Hampshire County, W. Va., April 16, 1831. In the fall of 1855 Mr. Chesshire with his family came to Illinois, first stopping in Sangamon County. The winter of 1855-56 was very severe and Mr. Chesshire resolved that he would not stay long in this State, but when spring came and under the fervid sun the spring flowers starred the prairie with a thousand colors, the aspect of the country was entirely changed and he concluded that in so fertile a land he could endure an occasional drawback in the way of a severe winter. They settled in Sangamon County and there remained about four years, then went to Christian County where they staid six years. At the end of this time they came to Shelby County where they purchased one hundred and sixty acres of land from the Illinois Central Railroad Company. The land was then raw prairie, but as the years have passed and the efforts of his labors appeared in fertile fields and orchards of fine fruit trees, it has become a first-class farm, upon which there is a comfortable dwelling that is provided with all the appliances for making life as pleasant as possible. Our subject and his amiable wife are the parents of eight children, of whom six lived to be grown. They are Frances, Jane, Rachael, Lucinda, Sarah A. and Michael W. Frances is the wife of Samson Shivers; Jane was twice married and now resides in Nebraska; Rachael is the wife of William Heimes; Lucinda was married to John McDonald and resides in Rural Township. Politically, our subject favors the independent party, although he was originally a Democrat. He has filled several local offices, having been Road Commissioner and also School Director. He is associated with the best men in the township in working for the elevation and improvement of everything that can give tone to the locality. In connection with his biographical sketch the attention of the reader is invited to a lithographic portrait of Mr. Chesshire, presented elsewhere in this volume. Extracted 12 Jan 2018 by Norma Hass from 1891 Portrait and Biographical Record of Shelby and Moultrie Counties Illinois, pages 387-386.